Perfect for kitchens, pantries, offices & more, this 5-bar LED under cabinet lighting kit is the solution to dark spaces around your home. Each DIY kit comes with everything needed for a quick, tool-free installation. 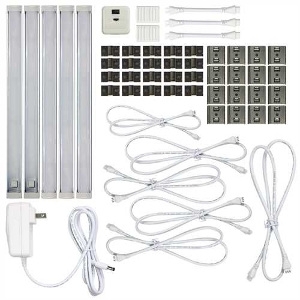 The 9" warm white LED bars included in your kit turn on and off with a motion sensor and feature 10 brightness levels. 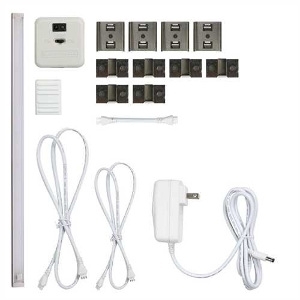 Ideal for use in offices, cubicles, break rooms and more, this 18" LED under cabinet lighting kit installs in minutes with no tools required. The included LED light bar gives off a cool white light for both efficient task lighting and modern accent lighting. Easily adjust the kit's light output with 10 brightness settings, and control power conveniently with the on/off motion sensor.